One reference found I have found is in the Wingham Division Ale Licence list, which shows the "White Horse," Nonington, to be re-licensed for the sum of 8 shillings in 1740, the licensee being Susan Rye. The White Horse in Church Street was built next to St. Mary's church and may well originally have been Church property as brewing was, before the Reformation, often carried out by monks as it was a good source of income for the Church and prior to commercial brewing the monasteries were the largest brewers. Many inns and alehouse evolved from the Church providing shelter and accommodation for travellers at one of their properties. The quality of the materials used in the construction of the premises show that was at one time a very high status building with extensive water cisterns underneath probably filled from the church roof. The earliest written evidence of its use as an alehouse is in 1607 when the parish register records the burial on June 22, 1607 of:- "John Hickmore a bachelor and a mason ript his own bellie lyeing upon a bed at Mother (Widow) Gooddins' (also spelt Goddin, Goodyn) the alewife by Nonington Church, which acte he did upon the Saturday about five of the clock in the afternoone and he died on the next day at noone. ‘Qualis vita finis ita'". This Latin epitaph translates as, ‘ As his life, so his end'. The Goodins appear to have been connected to the "White Horse" for some time previous, William Goodin died in January 1591 and Alice, his widow, probably succeeded him as licence holder. Alice Goodin nee Alice Deale was baptized at Nonington on January 11th 1542 at Nonington, and married William Goodin at Nonington on September 8, 1561. William was buried at Nonington on January 30th, 1591. In these times keeping an alehouse was one of the few opportunities for a women to run her own business, it is quite possible she ran the alehouse whilst her husband did another job, most likely as a tradesman, possibly as a blacksmith or carpenter or a husbandman (small tenant farmer). After her death, she was buried on May 24th, 1612, Alice was possibly succeeded by one of her sons, John, baptized January 4th,1561 or Sylvester baptized September 24th,1563. The next documented evidence available is from 1659. In 1659 the alehouse, a “parcels-messe or tenement called the White Horse togr. With the barne stable buildings dove houses courtyards gardens orchards and piece of land contg by est 2 acres now in the occ of the sd John Deane" (with Thomas Prebble and William Bean, both of the parish, as guarantors) and described as “a common ale-house or victualling house” was sold to John Deane, victualler, of Nonington and Thomas Petit, yeoman, of Knolton by Daniel Pingle, mariner, of St. John the Baptist parish, Thanet, Henry Pingle, butcher, of Nonington, and Thomas Pingle, bricklayer, of Nonington, the sons and heirs in gavelkind (a form of land tenure & inheritance unique to Kent) of Thomas Pingle, deceased, of Nonington. John Deane and Elizabeth Deane, his wife, probably occupied the premises for some time before 1659 but for how long is not presently known. Thomas Osbourne recorded as the licensee in 1674, he may well have succeeded John Deane at the alehouse. In 1672, Thomas had married his wife, Joan. “In the 12th. Year of William the Second” (1700) Thomas Petit, yeoman, of Knolton, William Petit, Gabriel Petit, and John Petit, heirs in gavelkind of Thomas Petit of Knolton who had died in 1699, sold the property described as “all that messuage or tenement with the barns stables smiths forge buildings courtyards gardens and all that part or parcell of arable land enjoining by estimation two acres more or less...called or known by the name of the White Horse” to William Hammond. Thomas Petit senior appears to have obtained sole tenure of the property at some time in the proceeding forty years. The properties location was described as being bounded by the lands of Thomas Marsh esq., to the east and north (Thomas Marsh at that time occupied Old Court and Church Farms), the highway to the south and the churchyard to the west. At the time of the sale the licensee was William Sharpe, who had married his wife, Sarah, on March 12th, 1697. 1706 (and possibly before) Laurence /Laurance Austen/Austin/Asting. House-holder and Innkeeper, buried November 12th, 1716. 1717.Elenor Austen widow of Laurence. Another change of ownership came in 1753 when Elizabeth Beake, a widow of Stourmouth who had inherited the premises from William Hammond, of St. Ann's Parish, Westminster, sold the White Horse to William Hammond, of St. Albans, Nonington, for £130. 10s 8d. 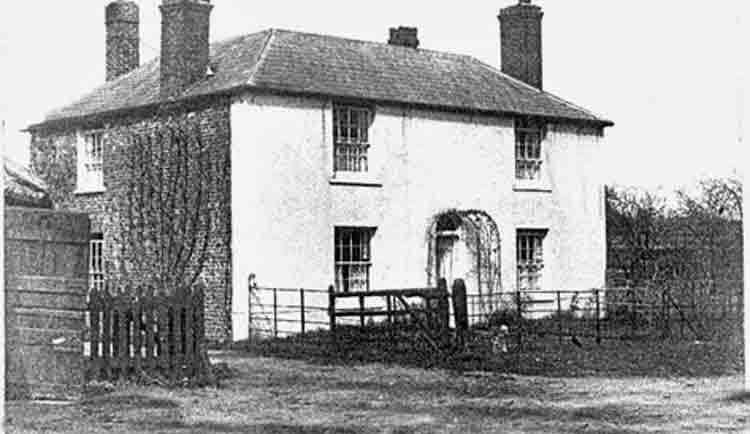 The property, now reduced to one acre in extent, was described as: “that messuage or tenement situated at Nonington in a place there called Church Street and called or known by the name of the White Horse with outhouses buildings orchards gardens about half acre previously occupied by Laurence Austen now occupied by Thomas Prebble” as well as “the smiths forge" occupying about half an acre and consisting of: “stables outhouses yards gardens backsides and lands previously occupied by Christopher Spain now occupied by Henry Spain” but which had no living accommodation. At some point in the previous fifty years the alehouse and smithy had divided into two separate businesses. The next major change at the the alehouse “known by the name or sign of the White Horse” came in 1790 when it was leased from William Hammond of White Friars, Canterbury for twenty one years by William Baldock, brewer, of Canterbury and John Rigden, brewer, of Faversham, at a rent of forty pounds per annum payable in four parts on: January 5th, April 5th. July 5th. and October 10th., William Hammond retained the rights to timber, free libert, egress, ingress, and regress. James Makey continued as the White Horse's keeper until he was succeeded in 1798 by James Holtum or Holton who in turn was succeeded by his wife, Mary, in 1824. In 1825 the licence was taken over by William Wood, a member of a prosperous local family, whose nephew was the landlord of "Rose and Crown," now the "Two Sawyers," at Woolage Green. It was whilst under William's tenancy that the White Horse became the "Hawks Head" in 1826, remaining an alehouse until March 1832 when William Wanstall junior, who had taken over from William Wood in May 1831, ceased trading as an alehouse keeper on these premises. The closure seems strangely abrupt as Wanstall's new premises, the "Royal Oak" in the Drove, lower Old or Holt Street, was not licensed at Wingham Petty Sessions until the following September. The closure may have been due to a change of views on the sale of alcohol by the owner.